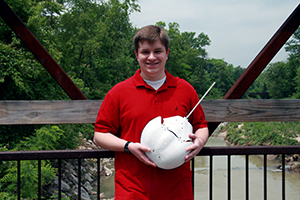 Greg Krummel, an undergraduate student in Professor S.K. Gupta’s (ME/ISR) lab, has won an Engineering Honors Program Outstanding Research Award for his undergraduate honors thesis paper, "Development of a Horseshoe Crab-Inspired Robot for Surf Zone Traversal." In the paper, Greg described how horseshoe crabs’ shapes, morphology and locomotion methods help them navigate their sand-surf-water environments. He then explained how he adapted these features into a robot that can travel in sand and water, and rights itself when it is flipped over by a wave in surf-zone turbulence. Krummel built a bio-inspired robotic horseshoe crab that employs many of the features and strategies real horseshoe crabs use, especially when moving from sandy beaches through the surf and into the water. As part of his research, Greg reviewed biological papers on horseshoe crabs and did a live study in Delaware to observe how they move and how they right themselves when the surf flips them over. Greg incorporated these details into building and programming the Robo Crab, which is the same size as a real crab. The Robo Crab is entirely waterproofed for surf and water conditions, and its telson (tail) helps it flip over just like a real crab. Krummel graduates on May 23 with a B.S. in Mechanical Engineering. This fall he will enter Virginia Tech’s Ph.D. program in Mechanical Engineering, where he will continue his focus on bio-inspired robotics.